Martha Gellhorn and Ernest Hemingway, both writers, both journalists, sharing the same dreams, competing with one and other even as they fell in love. A trusted author in Paula McLain. Returning to the life of Ernest Hemingway nearly 10 years after The Paris Wife. Learning more about a female war correspondent ahead of her time. Martha Gellhorn – Prior to reading this book, I knew little more about Martha Gellhorn than her name and connection to Hemingway. What a delight to get to know this amazing writer/journalist while reading Love and Ruin. Told in first person, it quickly became obvious that Martha Gellhorn was a powerhouse in her own right. Before she’d ever met Hemingway, Martha had published two books and traveled the world on her own. Writing and reporting were her passions and throughout this story, McLain made that clear. I appreciated that Gellhorn was willing to take some advice and even some help from Hemingway, but that she always followed her own instincts. Gellhorn’s relationship with Hemingway and her career as a war correspondent both began in Spain at the time of the Spanish Civil War, but with or without Hemingway, she carried on reporting from war zones. Life of Writers – The contrast between the writing lives of Hemingway and Gellhorn was fascinating. During the years of Love and Ruin, both had periods where their writing was stalled. McLain made you feel the frustration of living with another writer who was writing like crazy and, for Martha, she also dove into the pain of failure. The balance of power between Gellhorn and Hemingway never quite tipped in Martha’s favor, but she, more than Hemingway, never lost sight of what was truly the essence of who she was, a writer. It was impossible not to admire the lengths Gellhorn would go to get a story. Despite being a woman she eagerly covered wars in the 30’s and 40’s. History Lesson – I’ve read many, many books on WWII, but Love and Ruin covered parts I knew very little about. It was especially interesting to read about how journalists covered wars during that era. Like now, they were able to get remarkably close to the fighting, reporting on it and the human-interest stories created by war. I had never even heard of the Winter War that took place during 1939-1940 as Russia repeatedly bombed Finland and the Finish bravely fought back. Martha covered this war while Hemingway stayed at their home in Cuba. That Writing – As in her other recent books, Paula McLain takes a woman, finds out everything she can about that woman, and then creates a character that is so full of life the reader feels like she’s a friend or a relative. She stays with the story and can beautifully turn a phrase. I highlighted dozens of passages, all gorgeous and rich in meaning. “I didn’t want to cause trouble; I only knew what I knew. That Ernest could eclipse me, large as any sun, without even trying. That he was too famous, too far along in his career, too sure of what he wanted. He was also too married, too dug into the life he’d built in Key West. Too driven, too dazzling. Hemingway – There were very brief chapters told from Hemingway’s perspective and while they didn’t bother me, I thought they were unnecessary. Occasionally Slow – Just that. Every once in awhile, Martha’s story bogged down just a bit with the history. I found this mainly true during the Winter War. The Paris Wife by Paula McLain – If you’ve never read about Hemingway’s first wife, Hadley Richardson and their years living in Paris, you need to. Circling the Sun by Paula McLain – Yes, this is an ALL Paula McLain post. In this you’ll travel to 1920’s Kenya for the life of Beryl Markham, an early female aviator and so much more. Note: I received a copy of this book from Ballantine Books (via NetGalley) in exchange for my honest review. Don’t worry about it! We can’t feel the same about all books. Terrific review and breakdown for what did and didn’t work for you. I really enjoyed learning about Martha – what a woman! I agree and the material in the back about her was so interesting. Excellent! So glad you liked this one. It sounds right up my alley and I plan to get to it this spring. Actually can’t wait. The subjects/people McLain writes about — are always so enticing to read about. I liked Circling the Sun a lot so I think I will like this one as well. thx for the report. You’re welcome, Susan. Isn’t it nice when an author is so solid and such a brilliant storyteller? We felt about the same for this book- although Hemingway may have bugged me more, which is true of anything too male-centric these days! I loved her thoughts on writing! I highlighted so many of them. I imagine they are McLain’s thoughts as well because her writing must take a tremendous amount of work. 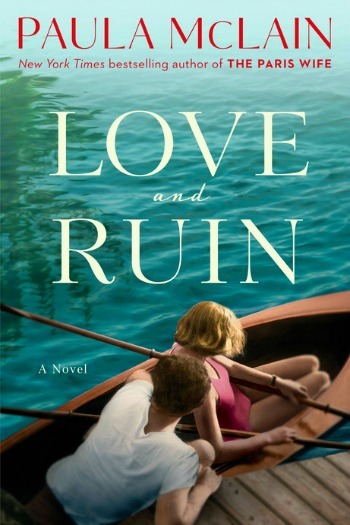 After Love and Ruin, Paula McClain is one of my very favorite writers. Her last three books have been so solid. She does women right!